In November 2013, journalist Iris Kuo sent her friend Camille Ricketts an email about an article she saw in The Washington Post. In it, Wall Street maven Sallie Krawcheck proclaimed, “I’ve had numerous groups of women say to me they would stop buying from a company if they understood what their gender makeup was. That information’s not available.” We recognized the same opening, we heard the call, and we took action. The result is LedBetter, and it launches today. After years of data collection with a devoted team of volunteers, LedBetter is now a fully-fledged research group that spotlights the gender ratios on boards of directors and executive leadership teams at the world’s most popular consumer brands. Our website is an app, making this data easily searchable, visible and (perhaps most importantly) sharable. Now anyone who cares about gender equality has the data they need to shop according to their values. Backed by the International Women’s Media Foundation, LedBetter’s mission speaks to enormous evidence that women in corporate leadership make a difference to the success of companies. Earlier this year, the Peterson Institute for International Economics released a study of 22,000 companies showing that having women in top leadership was correlated with higher profitability. And nonprofit group Catalyst has shown that having more women on boards of directors correlates with higher return on sales and better stock growth. The evidence is gaining momentum. 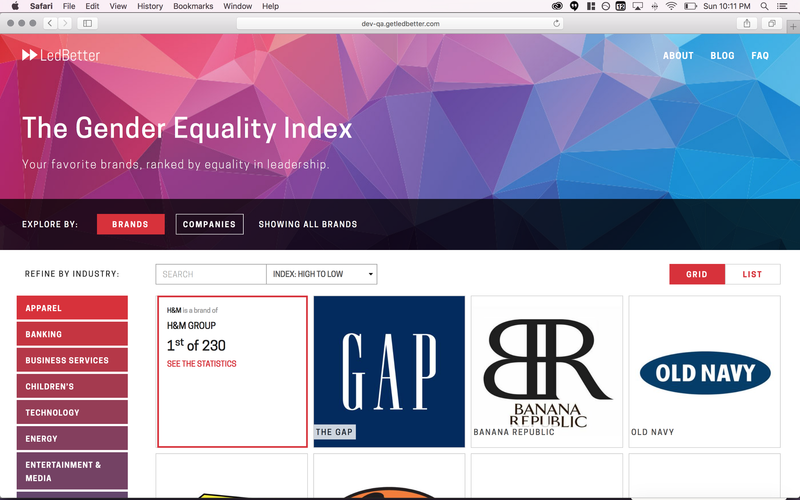 Some brief logistics: To rank brands according to gender equality, we’ve created the LedBetter Index Score, reflecting the average of a company’s percentage representation on its board and executive team on a 100-point scale. For example, a company with a LedBetter Index Score of 20.1 would have a 20.1% average female representation across its board and executive team. This made it easy for us to paint a picture of who does well when it comes to gender equality — and who needs to pick up the pace. Only 6% of the database’s CEOs are women — that’s 14 female CEOs out of 230 companies featured. Average board representation was 23%, and average executive team representation was 19%. A company’s executive team is defined by the executives listed on its investor relations/corporate governance website. By industry, energy scored the worst, with an average Index Score of 13.3, followed by transportation, which scored 14.9. Coty — which sells Rimmel makeup, Sally Hansen beauty products and fragrances by Beyonce, Katy Perry, Halle Berry and Jennifer Lopez — has no women on its executive team or board. Compagnie Financière Richemont, which owns the Cartier luxury jewelry brand, has a score of 2.8, representing 6% women on its board and zero women on its executive leadership team. In some cases, results were uneven but still notable. Revlon, maker of Revlon and Almay beauty products, has 7% female executives and a 33% female board. Mattel, maker of Barbie dolls, has 0% women on its executive team and 30% women on its board. LVMH, which owns Louis Vuitton, De Beers and Sephora, has 8% female executives and 35% female board members. Several well-known companies scored a zero on the LedBetter Index, with no women on either their boards or executive teams — Nintendo, Kia*, Samsung* and Nissan. Discovery Communications, which owns the Oprah Winfrey Network, has no women on its board. Honda has no women in executive leadership, and neither does Adidas, which also owns Reebok. H&M Group boasts 58% women on its board and 41% in top leadership. Kering, which owns Gucci and Yves Saint Laurent, has a board that’s 64% women and an executive team that’s 36% women. Gap, Inc. has a 36% female board and a 57% female executive team. Best Buy, Prada Group, Etsy and Diageo (maker of Johnnie Walker) were also among the highest scorers in the index. Unilever, owner of everything from Dove to Noxzema, Klondike to Vaseline, scored 40.6 with its gender equal board and 31% female executive team. To encourage a different future, we can’t just illuminate the failures. We have to celebrate the wins as a way forward. Highlighting these brands will hopefully not only lead a sea change in corporate leadership, but inspire the many young women out there who may have never considered becoming CFO, COO, and of course CEO, because the path is unworn and poorly lit. It’s getting clearer every day. We know our work is unfinished. With just about 2,000 brands in the LedBetter Database today, there’s so much more to do. We want to shine the same light on private companies, educational institutions, and even government agencies. We want to do the same diligence for underrepresented minorities. We want to factor in other elements of good, solid, representative leadership and help consumers make more values-driven, impactful decisions. But we’re excited to start here, and hope you’ll visit the site, discover new information, and share with the people in your life who care about these issues. You can learn more about our methodology here, and about the folks who poured their hearts and minds into building LedBetter here. We also want to hear from you if you want your company included on the Index, if you spot a change that needs to be made, if you want to volunteer for us, or if you want to donate to support our triumphantly scrappy operations. You can reach us at hello@getledbetter.com. There’s a movement brewing. It’s not pure coincidence that the White House is hosting its first ever United State of Women Summit today. It’s not for nothing that a major party is finally nominating a woman for president. We’re thrilled to be joining a community of other organizations working right now on the same big, thorny problems (that will take even more of us to solve). All together, we can make a difference. Let’s build a world led better. Check us out at getledbetter.com. And follow us on Twitter @getledbetter, on Medium, LinkedIn and Facebook. Your support means the world to us. Please feel free to download, embed and share.